Nicholas Tse busts some ghosts. The Skinny: A bit strained at times, this pop-star fueled action comedy is actually a welcome Hong Kong Cinema experience. Cribbing a bit from the director Stephen Tung's Magic Cop, this action comedy manages to deliver something approximating the Hong Kong Cinema experience. Just throw in some special effects, some modern soul-searching and the requisite popstars and you have the basic gist of 2002. 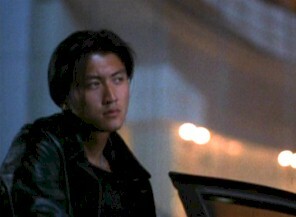 Nicholas Tse is Chiu, a somber cop who is the lone member of 2002, a special task force dealing with the paranormal. He's also fated to kill anyone who's close to him, as he was born under the Star of Death (cue Man Called Hero theme music). Chiu keeps to himself and avoids friends and lovers. When his current ghost partner Sam (Sam Lee in a cameo) gets on the reincarnation train, Chiu finds a new fated partner: Fung (Stephen Fung), a somewhat daffy cop who has the special ability to see the undead. Unfortunately, funeral salesperson Paper Chan (Law Kar-Ying) tells Chiu that Fung is fated to die soon, as 2002 must always consist of a man-ghost partnership. As the two become friends, Chiu finds himself increasingly distracted by their fates. Meanwhile, an evil Water Demon (Alex Fong Lik-Sun) arrives to make things difficult. And there's romantic entanglements, too. Despite the popstar-friendly situations, director Wilson Yip and screenwriter Vincent Kok manage to bring something entertaining to the screen. The ghostbusting gadgets may be high-tech, but they're grounded in the same Taoist supernatural shenanigans that made Stephen Tung's Magic Cop so enjoyable. Helping things are Nic Tse and Stephen Fung, who handle the action sequences well despite being aided by slow-motion and quick-cutting. Tse, in particular, shows that his star is definitely on the rise. Even when saddled with ridiculous romantic subplots (involving the dubbed and wooden Danielle Graham), the junior Tse brings charisma and weight to every scene. He's the straight man to the wacky antics of Fung and Law Kar-Ying, and he even punctuates the jokes nicely.